Originally from Yorkshire, Paul Stafford has one of those rare attitudes able to enjoyed both arts and sciences in the same measure. While studying Natural Sciences and Psychology at Cambridge University, he met Selina Horshi, English Literature student from Northern Ireland. That’s when their story, but also the story of their brand - The Seasons Hats - begun. After few years in London together, they both came to the realisation that they wanted to create something which would have made people feel happy and confident. Something which could be used to both attract attention and hide beneath. Of course, it all came down to hats. Beautiful, unique and creative hats which have changed many youngsters’ perception towards millinery. Through The Seasons Hats, Paul and Selina aim to keep the heritage of hat making alive, fighting against the struggles of a business that many - especially within the fashion world, today - would consider obsolete, but which carries and layers layers of beautiful tradition, ready to be translated into modernity. 1. Paul, you initially studied Natural Sciences, before making a dramatic switch toward millinery. What inspired the change? After University, I started working for one of the Big 4 accountancy firms but I wanted to do something creative in my free time. As I had made headpieces for Selina and other friends to wear to university balls and events, I did a millinery course at the London College of Fashion. Loving this, I went on to train under Rachel Trevor-Morgan, who holds a Royal Warrant for making hats for the Queen and then went on to my MA. 2. Do you feel like your scientific training has somehow been useful in your career as a milliner? It’s certainly useful to have an understanding of business management when starting a label. It’s just the two of us, so you Have to wear so many hats at the same time. I also have a very technical approach toward construction. I love working out new techniques when designing our collections. 3. Selina, what fascinates you the most about hats? When we started the business, I was a little concerned that we’d be entering an industry where everyone knows each other, and it’s a relatively limited market. I was really happy to find out how supportive an environment millinery is and the feeling of community about it. We all want people to wear more hats! 4. What made you decide to leave a successful career in Digital - such an up-and-coming field - to dedicate yourself to something much more traditional such as hats? Both mine and Paul’s parents had their own businesses in which they worked together and it got to the point that both Paul and I felt that we were ready to do the same. Millinery is a very traditional industry but we saw a real gap in the market for refined, minimal headwear that people our age would like to wear. 5. Paul and Selina, why do you think women should wear hats, today? Because the right hat makes you feel happy and confident. They’re a piece of clothing that you can use to attract attention or to hide beneath. 6. What makes an intelligent, elegant, relevant hat? Integrity of design and construction, a piece that inspires confidence in the wearer. 7. Paul, what is your first memory of hats and what do hats represent for you? The caps and boaters that we wore to infant school - of course, emblazoned with the school crest - a very prominent way of marking us as part of a group. So much of clothing is about self expression, and the head is the most impactful part of the body to adorn, with its position and importance in communication. 8. 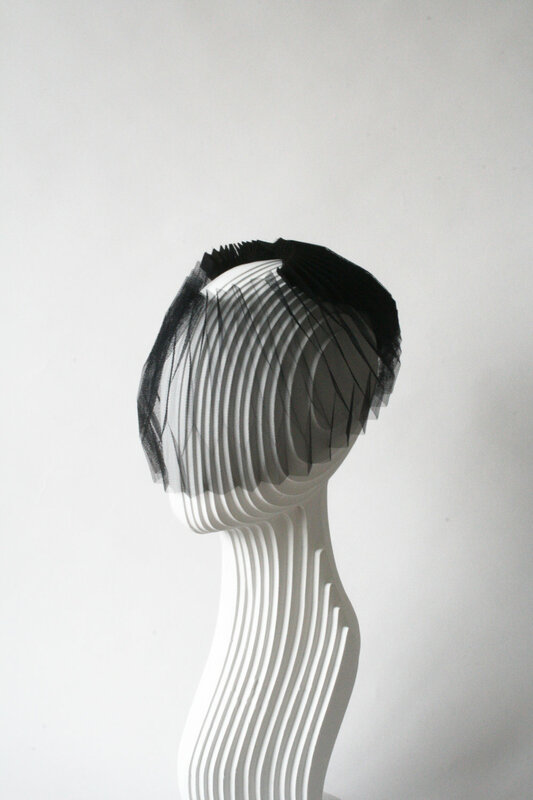 What do you see in the future of millinery? There’s a heritage of making that I hope will continue to be passed on - it’s a shame that even in the historically very short time that I’ve been making headwear how many blocking factories have gone out of business or traditional fabrics have stopped being made. Though I also think that all of fashion has to embrace change from technological and ethical standpoints and I hope that millinery is a part of this movement. 9. What would you like your contribution to be? I’m content if I can make beautiful work, and hope that it makes people happy. 10. Paul, what are you working on at the moment? I’m currently working on a piece for a bride I know very well. It’s a privilege to be able to contribute to the most important occasions in people’s lives. Though I can’t share anything about the piece yet, her fiancee knows nothing about it.